A few days ago a sweet sweet friend sent me this book filled with inspirational prints. This thoughtful gesture came at just the right time for me. I needed to be reminded that things will be okay. The print on the cover of this little book reminded us of this song by The Descendents. It also reminded me of one of my Daniel's poems, Following The Day. on 97, south of Okanogan. in Wilbur, Vanilla Coke in Omak. sings everything's going to be okay. Daniel is home for the week and having him here seems to be calming me down. Oh, how lucky I am to have him and Bono Baby in my world. Tis the season to count our blessings and my cup runneth over with gratitude for my family and friends. 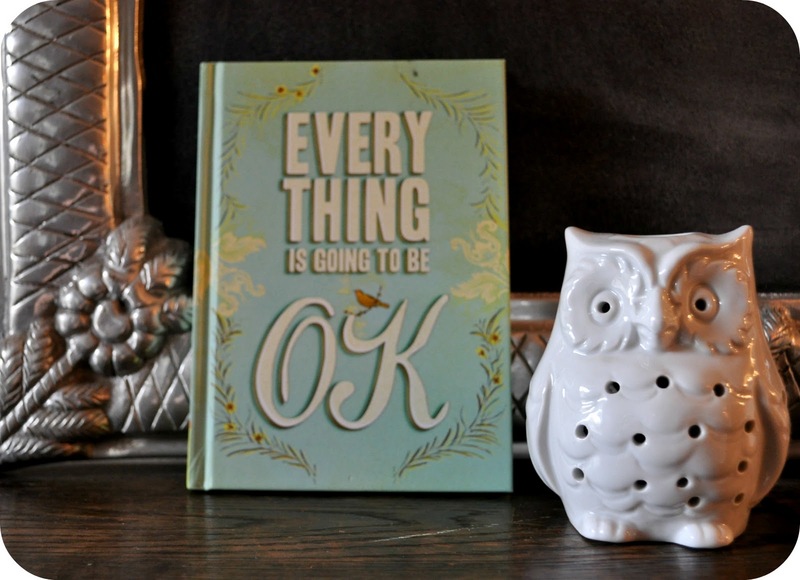 Here's to small reminders that indeed, everything will be okay. p.s. I found that little owl at an estate sale a few weeks ago. We have an owl who visits our backyard ever so often so I like to call this little guy our Alabama Owlie. i LOVE that song. and i love that poem. i have an everything is going to be ok print that i need to hang up because sometimes i need a reminder of that too. A Note From The Bono B.